After investigating a complaint by a narrowboat owner with 42 years’ experience, the Waterways Ombudsman has had to conclude that while Canal & River Trust admit that the canal north of Braunston Turn to Hillmorton is unsuitable for wide beam craft, their policy is such that these boats are not banned from the seven miles pound, writes Kevin McNiff. As such, the Ombudsman is therefore unable to uphold the complaint. 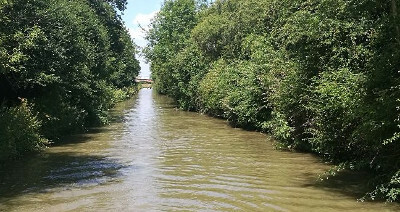 The published maximum criteria for the canal is quite clear and clearly shows the typical profile of a canal, in this case that the navigation is only a narrow beam navigation suitable for boats up to 7ft beam. Interestingly, the Ombudsman begins suggesting that as wide beams have already ventured along the pound, it must be suitable for them? That’s a bit like when large vehicles attempt to drive along unsuitable roads and tracks then find themselves unable to manoeuvre or get stuck after relying on satnav mis-information. 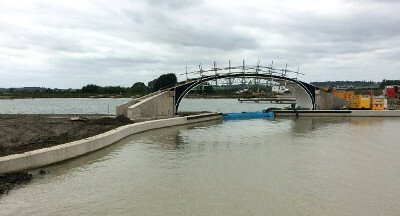 Construction of a new 550 berth marina at Onley began in 2016 following planning consent by the local authorities. Objections were raised over the planning application, one from the Braunston Marina owner being subject to a threat of legal proceedings by the developers over copyright infringement in use of their drawing and plans for the site. Over 200 individual objections were received. Despite these, the council granted planning permission, noting that CaRT as a statutory consultee [sic] offered no objections. The complainant was even reminded that CaRT had no authority to prevent the marina plans going ahead, but the question remains as to why it didn’t have a closer look at the plans and prohibit the navigation of anything over 7ft beam. This would still not have prevented the developers from providing internal facilities to crane in wide beam boats for mooring or servicing. Potential new moorers invited to the site during construction in 2016 were told that moorings, slipway and workshop facilities would be provided for boats over 7ft beam. The unusual curved marina entrance, approved by CaRT, seems designed to facilitate wide beam movement. The problem is that access along the canal to the marina is restricted due to the narrow profile of the canal bed, overgrown vegetation and lack of suitable depth out of the main navigation channel, not to mention the curves at blind bridges, curves specifically designed for 70ft narrowboats. Those familiar with boating this section of the canal are more than aware of the challenges faced, just merely passing two 7ft beam boats in several places. 'Delay. Incorrect action or failure to take any action'. Not according to the Ombudsman. While analysis of most marina-based boats does suggest that many owners don’t go out and they are used as floating cottages, there is no doubt that the additional internal area of a wide beam does offer many advantages. On the other hand, because all boats on CaRT waters must have a cruising licence, whether the owners go out or remain is a choice they are entitled to exercise. So is the potential navigation problem overstated? In response to the ombudsman’s investigations, the Trust deem that if a potential meeting of boats involving anything over 7ft beam 'bow to bow' were to happen, the risk of collision and grounding would increase along with craft getting stuck. This would be worse if two wide beams were involved. Its suggested solution would be for a boat to reverse a maximum of 2.25km where passing would be possible. 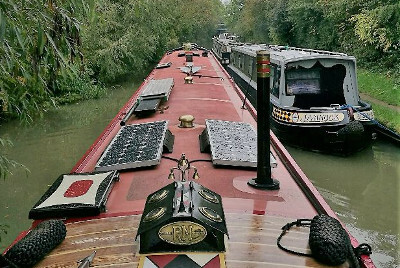 It is fair to say that the popularity of the canal can mean several boats following each other in both directions, which begs the question as to how all these boats could reverse—and to where? Propelling a boat in reverse is more than a challenge for anyone, with or without a bow thruster, and the ensuing melee would jam the navigation completely. And this is assuming one convoy of boats were willing to do it. 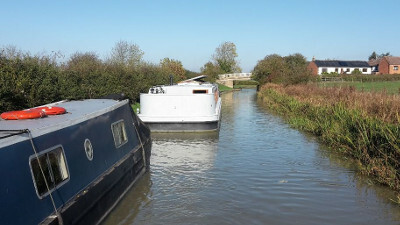 With three hire fleets north of Hillmorton, five in the Braunston/Napton area and varying levels of expertise in both hire and private boating, the outcomes could have a negative impact on all concerned. It has also been announced that the locks at Hillmorton passed over 10,000 boats in the 2018 season, up from 9,718 in 2017. And many more locking through when the volunteers are not on site! The Ombudsman’s terms of reference don’t require the post holder to be a competent navigator of waterways, but the same is unfortunately true of CaRT management, hence the questionable solution being tabled! Although he studied Google Earth photographs along this length, they don’t know the depth side to side—especially where offside field boundaries have been eroded. There are now several wide beam boats in both Dunchurch Pools and Barby Moorings marinas and at least one who seems to remain on the navigation. The number of wide beam boats on all CaRT waters is increasing to a level where separate licensing criteria are coming into effect. However, even faced with this, the Trust will go against its own published dimensions as a matter of policy, taking a 'monitoring and then react' approach. As can be seen from previous such moves in London, Bath and Oxford against increased liveaboard mooring, the problem will become a reality, and any future attempt to control it will surely fail. It is only the narrow locks at Hillmorton (and Stretton Stop) that seemingly halt wide beams going further north to Hawkesbury. In its attempt to attract future funding when the Government grant period ends, boaters are seeing no end of new schemes to attract millions [sic] of towpath visitors and users. Health and Safety has gone out of the window with lack of any control over unsuitable craft—kayaks in previously prohibited tunnels and aqueducts, pedal boarding across the Pontcysyllte near Llangollen—to mention a few. All, it would seem, being driven by the 'Wellbeing' mantra so loved by officialdom everywhere. 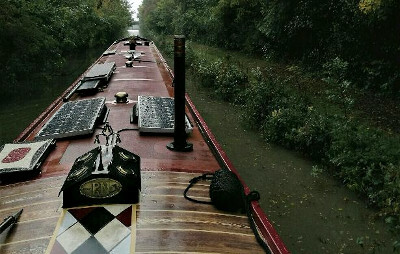 § Published windows of passage—like Braunston and Blisworth tunnels—to allow safe navigation for wide beam boats through the bund and to include one-way north/south timed movements. 10.00 - 12.00 for an organised canoe paddle. During this time, please follow instructions and/or advice from on site personnel. Sad but true, the day will surely come when the scenario of bow-to-bow confrontations become reality, abusive (verbal or physical) and vessel and infrastructure damage.